Looking for a volunteer thank you gift or something to add to a golf tournament goodie bag. 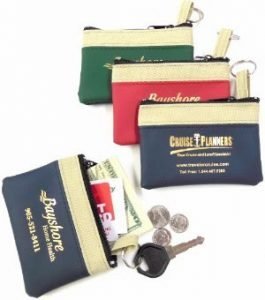 This handy zip coin purse can hold money, credit cards, coupons or ear buds. Made from solt suede vinyl with your logo, it will keep your message top of mind on a durable and practical accessory. that will keep your logo and message top of mind for years.The keyring strap is attached inside the purse so it can be used as a key case as well. Rustproof nylon zipper across top. Imprint in silver, gold, white, or black foil in 2-1/2″ w x 1-1/4″h imprint area. Items come in red, dark green, navy – all with khaki band (4 1/2” x 3” size). On sale at 85 cents for 100 min. Set up is 50.00. Add a carabiner for 35 cents per item. On sale through Feb 17, 2017. Regular price is 1.19 ea.